Peace Corps Online: November 21, 2004: Headlines: Staff: Journalism: Television: Rocky Mountain Telegram: As an interviewer, Bill Moyers couldn't be more unlike Tim Russert of "Meet the Press." His aim isn't to coerce an answer from his guest, or to create a scoop. Rather, it's to converse in a way that leads to illumination or understanding. November 21, 2004: Headlines: Staff: Journalism: Television: Rocky Mountain Telegram: As an interviewer, Bill Moyers couldn't be more unlike Tim Russert of "Meet the Press." His aim isn't to coerce an answer from his guest, or to create a scoop. Rather, it's to converse in a way that leads to illumination or understanding. Peace Corps Online: Directory: USA: Special Report: Peace Corps Deputy Director Bill Moyers: November 21, 2004: Headlines: Staff: Journalism: Television: Rocky Mountain Telegram: As an interviewer, Bill Moyers couldn't be more unlike Tim Russert of "Meet the Press." His aim isn't to coerce an answer from his guest, or to create a scoop. Rather, it's to converse in a way that leads to illumination or understanding. As an interviewer, Bill Moyers couldn't be more unlike Tim Russert of "Meet the Press." His aim isn't to coerce an answer from his guest, or to create a scoop. Rather, it's to converse in a way that leads to illumination or understanding. AUSTIN, Texas � Bill Moyers knows all about the arc of poetry, how the circle of our life leads us forever home. That's one of the reasons he came back to Texas this summer, on the last Friday in August, to visit the grave of the man who was once his boss: Lyndon B. Johnson. In a public ceremony at the LBJ Ranch, Moyers laid a wreath at Johnson's headstone. He shared memories of the president as a man of large dreams and great sorrows. And when it was all over � the honored guests departed � Moyers took off his blue suit coat and lingered a moment in the cool shadows. It was a breezy morning, too gentle for the season. The leaves of live oaks swished and hissed like waves of water in the summer wind. "I've never as a grown-up visited a cemetery without realizing how brief the time we're here, or how much we crowd into it," Moyers would say later. "Some � LBJ comes to mind � pack more in than the rest of us. So few years, so much done. And still, when it's all over, so much left undone." Bill Moyers turned 70 this year; he is much aware of the fleeting days. Mortality has long been a prominent subject of his journalism. Yet Moyers, a son of East Texas who once dreamed of becoming a minister before entering a life of politics and broadcasting, does not define cemetery in the context of sorrow. He feels in it, too, a spirit of peace and eternity � a place of contemplation. "I think I do more meditation in a cemetery than a church," says Moyers. "There's something reassuring about a country cemetery in particular � the visible quiet of it, the sense of invisible generations holding hands across time. Robert Louis Stevenson said there is 'a certain frame of mind to which a cemetery is, if not an antidote, at least an alleviation. If you are in a fit of blues, go nowhere else.' "
This moment, in which intellect and intimacy and humanity blend into one, defines Bill Moyers. No one in American media speaks quite the same language. The man's tendency toward all things thoughtful � rumination, conversation, meditation, consideration � is his great gift to his country and his craft. Moyers is the rare broadcast journalist who talks with us, not to us. He presumes we carry an earnest curiosity. He welcomes us as a kindred spirit. For more than three decades now, Bill Moyers has shown us that a man's journey can also be his job, that ideas and conversations are their own stories, that wonder and mystery are their own stories. He has demonstrated how one can embrace poetry and philosophy, literature and science, ethics and arts, that one can engage and explore all matters of spirituality � and that this life's work can be called journalism. It can also be called citizenship. Let us celebrate him, for Bill Moyers is soon to leave us. On Dec. 17, Moyers will step down as host of "NOW" � his 3-year-old PBS weekly news magazine � and retire from the full-time world of public broadcasting. It's not that he doesn't enjoy "NOW." Like a 21st-century Thomas Paine, Moyers is deeply invested in its front-burner issues � the perils of corporate media, our environment in crisis, the corruptive influence of money in government and, most of all, the sanctity of the public's right to know. It's hard for him to leave. Especially now. Yet Moyers knows all about the poetic arc, how the circle of our lives leads us forever home. There's a book he wants to write, an LBJ story. A half-century after he met Johnson during the 1954 U.S. Senate campaign, the time has come to tell it. "Let's sit for a minute," says Moyers, his voice welcoming, inviting us to linger in the cemetery. There is time yet to appreciate quiet things � to talk about listening and language, legacy, the precious days. He waves our way. "Let's sit . . ."
Bill Moyers has long defined journalism as a course of continuing adult education � sustained by one's passion for learning, passed along in the spirit of sharing. "It came to me long ago," he says, "that we journalists are like beachcombers on the shores of other people's wisdom and experience � and we go around picking this stuff up. "Some people think I'm smart. But they only think so because I have listened to so many people who know so much more than I do. . . . There's no one of us in journalism who can know more than the people we're dealing with know � about politics, about history, about art, about music, about culture. So we have to learn." Moyers' desire to broaden his education led to such celebrated PBS long-form documentary series as "Joseph Campbell and the Power of Myth," "A World of Ideas," "Healing and the Mind" and "Poetry: The Language of Life" in the 1980s and 1990s. He produced landmark shows on the American Constitution . . . and death . . . and blue-collar poverty . . . and the D-Day Invasion . . . and the Book of Genesis. Certainly, most journalists strive to learn; but it's the breadth of Moyers' interests that sets him apart. Betty Sue Flowers, director of the LBJ Library and a friend of Moyers', was once invited to consider his legacy as a journalist. "A journalist?" she responded, as if the word fit as well as jackrabbit. "I don't really think of Bill as a journalist." Flowers, who edited the companion books for "The Power of Myth" and "World of Ideas," clearly sees in Moyers a thinker and teacher and scholar, attributes not commonly ascribed to day-to-day journalists. Moyers would never presume to call himself a teacher. Yet consider the names that come up as he recalls the heroes of his life: Inez Hughes, Selma Brotze, Mary Tom Osborne, Eva Joy McGuffin. All teachers. "In asking us to listen, they were doing something very valuable for us, revealing to us something of beauty � poetry, in all its double and hidden meanings � that we wouldn't have understood had we read it alone. But those teachers expected something of value in return from us. Our attention. Our openness. Our curiosity." Moyers loves the teacher because she offers a gift of substance. It's an unselfish act; she extends herself in the faith that it enables students to grow and serve others. This is central to understanding Moyers and his approach to journalism. Sharing, for the sake of the greater human good, is central to the Moyers ethos. 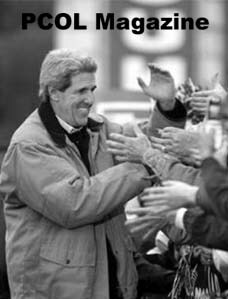 Remember, he served as deputy director of the Peace Corps under President John F. Kennedy. As special assistant to LBJ from 1963 to 1966, Moyers was a chief advocate for the Great Society and the War on Poverty. Should it be any surprise that he brought the same sense of progressive idealism to journalism? Moyers isn't just ahead of the curve when it comes to journalism; he creates his own distinctive arc. Consider "Consuming Images," a documentary in which he examined the social and psychological impact of mass-market culture in America. Does it matter to us, he asks, that the word "citizen" is giving way to the word "consumer" in our society? What happens when the culture of buy-and-sell intrudes into democracy? Do we really want to elect a president the way we shop at the grocery � choosing between two brands of canned corn? Or do we long for something more. . . .
Like so many Moyers documentaries, "Consuming Images" focused on a condition � not a news event. Rather than provide defining answers, it offered a starting point for reflection. It took its time. Yet the topic is as vital today as when it aired 15 years ago. "I was fortunate enough not ever to be hostage to the news of the day," says Moyers. "I would not make a good daily journalist, though I admire the journalist whose job is to take what happens yesterday and translate that into some intelligible form for an audience that's trying to figure out what was behind that explosion . . . or event . . . or accident. But I would not be very good at that. "I've always been concerned with, in effect, not even the second day's journalism � but the second month's journalism . . . a second opinion . . . analysis . . . Sometimes, my documentaries contain nothing new in them. But they contain what you'd see if you had seen dots connected as I have now connected them. That takes time. And it also takes a certain temperament." Bill Moyers is an artist of conversation. He uses different paints, sees different textures. As an interviewer, Moyers couldn't be more unlike Tim Russert of "Meet the Press." His aim isn't to coerce an answer from his guest, or to create a scoop. Rather, it's to converse in a way that leads to illumination or understanding. The approach is as old as Socrates. The result is genuine interaction. "I learned very early that extemporaneous listening is as important as extemporaneous speaking," says Moyers. "I developed early in television the importance of climates. That if someone gives you an answer and you immediately come in with another question, that person's mind � like a pool ball � will ricochet to another angle. So sometimes I will just be silent . . . and the guest will come forward with the next thing that's just below the surface of articulation." "What is it about Mark Twain that frightens people, even as he makes us laugh?" That one, to actor Hal Holbrook. "Do you think Jesus today would be a Christian?" That, to Joseph Campbell, the scholar of mythology. "You write and talk a lot about the meaning of life and the public good. What do you think gives meaning to life that we all have in common?" That, to sociologist Robert Bellah. Humanity is the great constant in a Moyers interview. When author Maurice Sendak appeared on "NOW," the two men talked about themes of persecution and shadows and the Holocaust in Sendak's art. In a tender moment, Sendak recalled the death of a childhood friend who was hit by a car while chasing a ball into the street. The author's enduring memory of the tragic moment is of the boy with arms outstretched, as if he were flying. Moyers: (Gently) So many children fly in your books. Ida. The kids on the bluebirds. . . .
Sendak: Yeah. . . . (chuckling) You're better than my therapist! Moyers: (Smiling) Cheaper, too. . . .
Moyers asks questions that reflect a man unburdened by ego. He's the rare journalist who's not afraid to let on when he doesn't understand. "I wonder why that is?" he'll say. Or: "What do you mean by that?" Moyers knows it's not his job to look smart � it's to interact, to further understanding. The man showed Austin a glimpse of this humility during a poetry reading to promote his book "Fooling with Words" in 1999. During a question-answer session, a woman in the audience at Book People remarked that Moyers had touched her, talking about poetry on a radio show that morning. She was so moved, in fact, she promptly wrote the first poem of her life. "Thank you," she said to him. "Do you have the poem with you?" Moyers responded. "Would you share it with us?" The woman read her poem. Then Moyers asked her specific questions about the writing. In the end, the sale of his book was a secondary concern. The moment was more about a shared appreciation of language. It was the perfect example of a Moyers conversation. Four months after the terrorist attacks of Sept. 11, 2001, Bill Moyers visited Austin to speak about faith. Moyers had promised Harry Middleton � then the director of the LBJ Library � that he'd examine this topic as a personal favor, on the occasion of Middleton's retirement. What better time, with America shaken, to address such a theme? "O God, open all doors to me. O God, who answers prayers and answers those who ask you, I am asking for your help. I am asking you for your forgiveness. I am asking you to lighten my way. I am asking you to lift the burden I feel. O God, you who open all doors, please open all doors to me, open all venues for me, open all avenues for me. God, I trust in you. God I lay myself in your hands. . . . "
"That's the prayer of a suicide bomber," Moyers told the audience. "But that's my prayer, too. I've prayed it over and again � almost the same words and certainly the same supplication. And the question persists: 'How is it the God of comfort, peace and hope to whom so many pray, becomes to some the God of cruelty, oppression, vengeance and death?' "
"In a pluralist world, what faith requires is humility. And whether my neighbor believes in 20 gods or no god, what matters to me is whether my neighbor has faith in democracy," said Moyers. "Creeds have made a slaughterhouse of faith, while democracy spares us from the orthodoxy of the sword. Trust in God, sure. But count on democracy to save us from those who would 'save' us against our will. The only antidote to bad theology, you see, is good democracy. . . .
"As we have been visited by tragedy, we are also presented with an extraordinary opportunity to define in deep and enduring ways our faith in democracy, and then to live that faith every day � personally, practically and politically � as if everything depends on it. Because it does." "NOW" was born out of this sense of urgency � reflecting its host's intuition that America was yearning for self-examination in the aftermath of Sept. 11. Where was the country going? How was it reacting? Would its course honor the values of its Constitution? The show has a progressive, cautionary edge � which might have surprised a few fans who had grown accustomed to the avuncular Moyers, the kindly man in the sweater, talking about Robert Bly or Eastern medicine. "We are moving toward an oligarchic society where a relatively small handful of the rich decide, with their money, who will run, who will win, and how they will govern," he writes in his latest book, "Moyers on America," published this summer. "The defenders of the present system will fight hard to hold on to their privilege, and they write the rules. Nothing short of an aroused public can change things, nothing less than democracy is at stake." 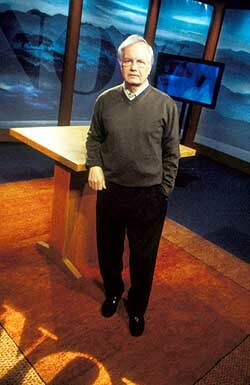 Moyers frequently steps out of the traditional role of objective host on "NOW" � "corporate greed" is his statement of fact, not opinion � and implores his viewers to engage in their democracy. Some conservative bloggers don't like it, and they're rejoicing as Moyers nears retirement. Yet in many respects, Moyers is reminiscent of Walter Cronkite in the 1960s, when he spoke out against the Vietnam War. "It's an apt observation," says Moyers. "I don't believe journalists should help one party or another win elections. But we should try to help voters know what seasoned, experienced people � like journalists � think about what they're hearing and seeing. "Very often daily journalism never gets to the truth behind the news; we stick on the news. But when you've lived as long as I have, had as much experience as I have, talked to as many people as I have, read as much as I have, you know � often � whether the news leads to the verifiable truth. I'm morally obligated to share that with people . . . Not to win them over, but to enable them to act as a moral agent in a democracy." Despite his progressive bent, Moyers holds his door wide open to all views on "NOW." He listens to Rush Limbaugh. Republican power-broker Grover Norquist is a frequent guest. Moyers even invited conservative columnist Cal Thomas to join him to discuss religion in America � again, in the spirit of understanding. "I know you are theologically and politically conservative," Moyers said in greeting Thomas. "I know we share similar backgrounds. We read the same Bible. We pray to the same God. And I'm interested in your insight over how two people like us come to opposite conclusions about an issue like gays in American life. . . ."
"George W. Bush's election would mean four more years of radical policies that are putting America's financial security at risk, isolating us from the rest of the world when global collaboration is needed to meet global threats, militarizing our own society out of a fear of terrorism, despoiling the environment, and shredding the social contract. "The biggest change in politics in my lifetime is that the delusional is no longer marginal; President Bush has brought it into the White House. Not alone as a journalist for whom facts matter . . . or as a citizen . . . or a grandfather . . . I am aghast at the reckless ways in which an ideological administration has put the interests of its donor class over its obligation to reality." Moyers will miss "NOW." "But remember those meditations in the country churchyard," he says. "There's a time for staying and time for going. And this is a time for going." So let us end it there. Let us say farewell in the churchyard at Stonewall. Moyers sits before us, once again, on the rock wall that bounds the LBJ cemetery. It is a grand and rugged and serene landscape, wind blowing over the Pedernales River beyond us, the grass on the bank lush from the summer rains. Moyers' face has a sharpness to it; age has accentuated the angles of his mouth, his chin, his brow. "I don't know what it feels like to be 70. I am old. But I don't feel it," he says, oak leaves rustling in the wind. "I do feel time. The clock seems to be ticking faster for me now. There's some things I want to do, and one of them is to share with people what � after a long and interesting life � I have learned about democracy." After leaving "NOW," Moyers plans to stay in New York, speak and write and celebrate his 50th wedding anniversary. There are five unfinished books waiting for him on the nightstand, one about New York churchyards. He might produce an occasional miniseries, but don't get the wrong idea. Moyers has reached that moment "when one takes the preeminence of an honorable age in old wine to drink, old wood to burn, old books to read, and old friends to talk." "It's a paradox. My world gets larger every day, because I'm exposed to more ideas, more books, more people. I learn from them," he says. "My world also gets smaller every day, because the people I know and love are dying. So I'm caught in that human dilemma. Life is ultimately tragic, because it ends in death, often before we've run out of ideas. But it doesn't make me morbid. It makes me feel urgent. I feel urgency about the best use of the remaining time." One of Moyers' great mentors, the late Joseph Campbell, spoke eloquently to Moyers about journey � how the essence of hero's journey, in mythology, is a life lived in self-discovery. "The ultimate aim of the quest," he said "must be neither release nor ecstacy for oneself, but the wisdom and the power to serve others." Bill Moyers' journey is not yet finished. But he has already left us with the hero's gift. It is as enduring as the wind and stone in a Texas cemetery. Brad Buchholz writes for the Austin American-Statesman.